T. Ibi, E. Komada, T. Furukawa, S. Maruo, “Multi-scale, multi-depth lithography using optical fibers for microfluidic applications,” Microfluidics and Nanofluidics 22, Iss. 69(2018). K. Koyama, M. Takakura, T. Furukawa, and S. Maruo, “3D Shape Reconstruction of 3D Printed Transparent Microscopic Objects from Multiple Photographic Images Using Ultraviolet Illumination,” Micromachines 9, No. 6, 261 (2018). T. Kageyama, C. Yoshimura, D. Myasnikova, K. Kataoka, T. Nittami, S. Maruo, and J. Fukuda, “Spontaneous hair follicle germ (HFG) formation in vitro, enabling the large-scale production of HFGs for regenerative medicine,” Biomaterials 154, 291-300 (2018). K. Kakegawa, R. Harigane, M. Aida, H. Miyahara, S. Maruo, A. Okino, “Development of a High-Density Microplasma Emission Source for a Micro Total Analysis System,” Analytical Sciences 33, No. 4, 505-510 (2017). T. Zandrini, S. Taniguchi, S. Maruo, “Magnetically driven micromachines created by two-photon microfabrication and selective electroless magnetite-plating for lab-on-a-chip applications,” Micromachines 8, No. 2, Article No. 35 (pp. 1-8) (2016). K. Monri and S. Maruo, “Three-dimensional ceramic molding based on microstereolithography for the production of piezoelectric energy harvesters,” Sensors and Actuators A 200, 31–36 (2013). Y. Daicho, T. Murakami, T. Hagiwara, and S. Maruo, “Formation of three-dimensional carbon microstructures via two-photon microfabrication and microtransfer molding,” Opt. Mater. Express, 3, Iss. 6, 875–883 (2013). T. Ikegami, R. Ozawa, M. P. Stocker, K. Monaco, J. T. Fourkas, and S. Maruo, “Development of optically-driven metallic microrotors using two-photon microfabrication,” Journal of Laser Micro / Nanoengineering, 8, no. 1, 6-10 (2013). T. Ikegami, M. P. Stocker, K. Monaco, J. T. Fourkas, and S. Maruo, “Fabrication of three-dimensional metalized movable microstructures by the combination of two-photon microfabrication and electroless plating,” Jpn. J. Appl. Phys. 51, no. 6, 06FL17 (2012). T. Torii, M. Inada, and S. Maruo, “Three-Dimensional Molding based on Microstereolithography Using Beta-Tricalcium Phosphate Slurry for the Production of Bioceramic Scaffolds,” Jpn. J. Appl. Phys. 50, no. 6, 06GL15 (2011). S. Murakami, M. Ikegame, K. Okamori, and S. Maruo, “Evanescent-Wave-Driven Microrotors Produced by Two-Photon Microfabrication,” Jpn. J. Appl. Phys. 50, 06GM16 (2011). K. Mukai, S. Kitayama, Y. Kawajiri, and S. Maruo, “Micromolding for three-dimensional metal microstructures using stereolithography of photopolymerized resin,” Microelectronic Engineering 86, 1169-1172 (2009). S. Maruo, T. Hasegawa, and N. Yoshimura, “Single-anchor support and supercritical CO2 drying enable high-precision microfabrication of three-dimensional structures,” Optics Express 17, Iss. 23, 20945–20951 (2009). S. Maruo, A. Takaura, and Y. Saito, “Optically driven micropump with a twin spiral microrotor,” Optics Express 17, Iss. 21, 18525–18532 (2009). M. Inada, D. Hiratsuka, J. Tatami and S. Maruo, “Fabrication of Three-Dimensional Transparent SiO2 Microstructures by Microstereolithographic Molding,” Jpn. J. Appl. Phys. 48, no. 6, 06FK01 (2009). S. Maruo, T. Hasegawa and N. Yoshimura “Replication of Three-Dimensional Rotary Micromechanism by Membrane-Assisted Transfer Molding,” Jpn. J. Appl. Phys. 48, no. 6, 06FH05 (2009). S. Saito, Y. Katoh, H. Kokubo, M. Watanabe, and S. Maruo,”Development of a soft actuator using a photocurable ionic gel,” J. Micromech. 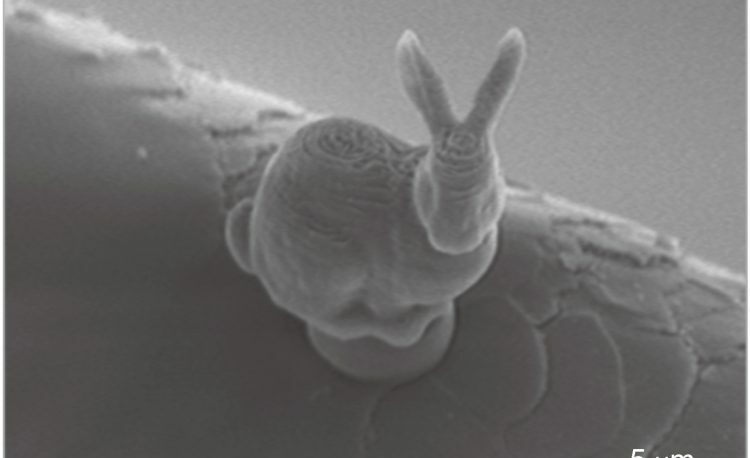 Microeng. 19, 035005 (2009). K. Mukai, S. Kitayama, T. Yoshimura and S. Maruo, “Ferrite and copper electroless plating of photopolymerized resin for micromolding of three-dimensional structures,” Jpn. J. of Appl. Phys. 47, no. 4, 3232-3235 (2008). K. Mukai, S. Kitayama, S. Maruo, “Electroless and electrolytic plating of Ni, Cu, and CoxFe2-xO4 for the application of three-dimensional micro-molding,” Journal of photopolymer science and technology 21, no. 1, 53-58 (2008). S. Maruo and T. Saeki, “Femtosecond laser direct writing of metallic microstructures by photoreduction of silver nitrate in a polymer matrix,” Optics Express 16, Issue 2, 1174-1179 (2008). S. Maruo and Y. Hiratsuka, “Optically driven micromanipulators with rotating arms,” Journal of Robotics and Mechatronics,19, no. 5, 565-568 (2007). S. Maruo and H. Inoue, “Optically driven viscous micropump using a rotating microdisk,” Appl. Phys. Lett. 91, no. 8, Art No. 084101 (2007). K. Mukai, T. Yoshimura, S. Maruo, “Micromolding of three-dimensional metal structures by electroless plating of photopolymerized resin,” Jpn. J. of Appl. Phys. 46 (4B), 2761-2763 (2007). K. Mukai, T. Yoshimura, S. Kitayama, S. Maruo, “Electroless and electrolytic plating of photopolymerized resin for use in the micro-molding of three-dimensional nickel structures,” Journal of photopolymer science and technology 20, no. 2, 285-290 (2007). 井上宏之，芳賀誠士，丸尾昭二“２光子マイクロ光造形による光駆動マイクロギアの開発” 電気学会論文誌Ｅ, vol. 126-E, no.6, 216-221 (2006). 平塚洋二郎, 丸尾昭二 “光制御マイクロマニピュレーションシステムの開発,” 電気学会論文誌Ｅ, vol. 125-E, no. 12, 473-478 (2005). S. Maruo, K. Ikuta and H. Korogi,“Force-controllable, optically driven micromachines fabricated by single-step two-photon microstereolithography,” Journal of Microelectromechanical Systems 12, no. 5, 533-539 (2003). 丸尾昭二，生田幸士，蜷川稔英，“マルチポリマー・マイクロ光造形法の開発（造形システムの試作と光導波路への応用）,” 電気学会論文誌Ｅ, vol. 120-E, no. 7, 370-374 (2000). S. Maruo, O. Nakamura and S. Kawata, “Evanescent-wave holography by use of surface-plasmon resonance,” Applied Optics 36, no. 11, 2343-2346 (1997).